I'm a teeny bit worried that Apple may reject our upcoming iPhone/Magnatune app, because they recently rejected another music application for using too much bandwidth. I'd rather not limit the iPhone/Magnatune app to only being used on wifi, because it does work well on 3G as well. And once Apple rejects you, it's hard to get them to give you another chance. So... I want to put our best foot forward the first time we apply to them. I was thinking that the best way to make Apple happy would be to add a "buy from iTunes" link to the iPhone/Magnatune app. By doing that, Apple won't see us as competing with them, and instead will see us as helping promote sales of our music on iTunes. 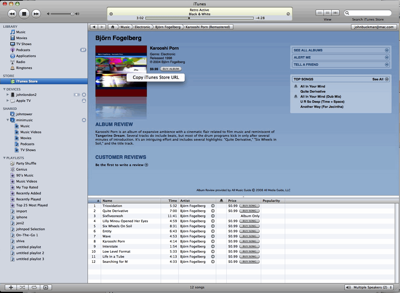 You can buy music directly from the iPhone, and it will sync back to your iTunes folder. 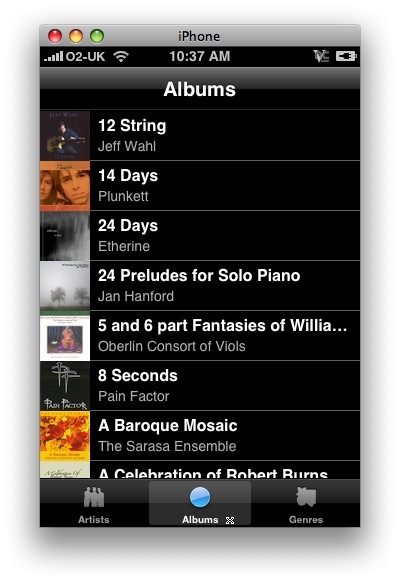 Plus, all of the Magnatune-supplied music on iTunes is DRM free. But... I need some help. I need somebody to spend an hour or three matching up each album at Magnatune with a URL to the right iTunes store page. What you need to do is for each and every Magnatune album, go to the iTunes store, find the appropriate album, right click on the artwork, and copy the URL. Then, put the URL in a document to me, clearly labeling what Magnatune album it belongs too. I can then put that into our database. Sometimes, the album is available from iTunes directly from the musician, and not through us, which is totally fine (as in the example on the bottom of this blog entry). About 2/3rds of Magnatune albums are on iTunes through us, and the rest should be also available on iTunes, through arrangements the musician made on their own. Update: a big thanks from me to Chris Allen and Chris Harvey for volunteering to do this and getting it done (and nicely done too) in just a few short days. Thanks Chrises! In a previous blog entry, I wrote about how you can now choose how much you want to pay for an all-you-can-eat Magnatune membership. These memberships let you listen and download everything on Magnatune, without any limits. From today on, you are no longer required to commit to a 3 month minimum: you can have as short a membership as one month. Also, since the majority of people pay for memberships using Paypal (vs credit cards), we now support Paypal's recurring payments feature, so that you can choose to auto-renew, yet retain total control over billing by being able to cancel from within your Paypal account. I've been working with Leah Belsky (from open-source-philosopher-guru Yochai Benkler's group), to phase in each change at Magnatune in a controlled-experiment kind of way, so that both Magnatune (me) and the academics (Benkler's group) can get data that is meaningful, quasi-scientific and which hopefully leads to insight. The final step in this transition happened today. 2) pay what you want: you fill in the amount you want to pay (no drop down box), though there is a $5/month stream membership minimum, and $10/month download membership minimum. 3) paypal recurring payments: use paypal recurring payments instead of a credit card, so you are completely in command of your membership, and can cancel it from Paypal if you like. 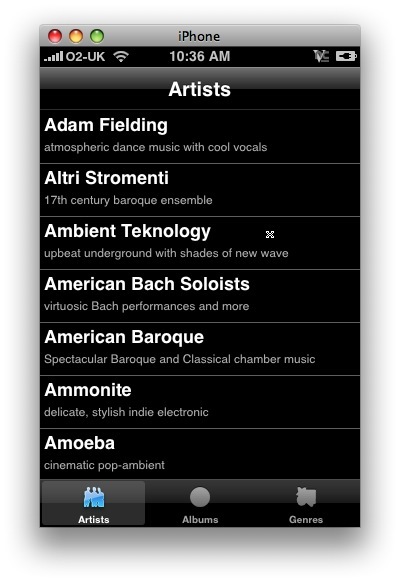 7) Everything: complete access to all our music. 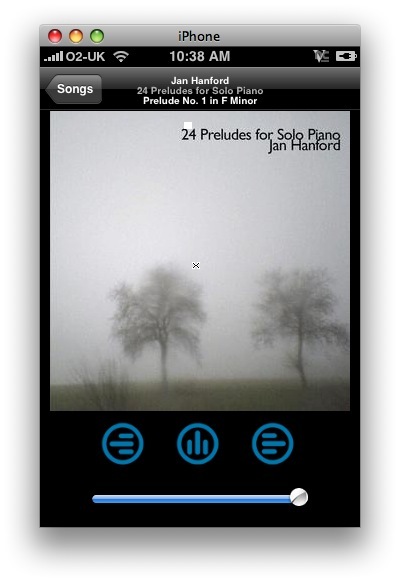 Downloads, 4h podcasts, streaming, iTunes & Amarok & Rhythmbox & Songbird support, and more. 8) Musicians get paid: with everything you do, 50% of your membership fee goes to the musicians you listen to. Magnatune remains fair to the musician. This is no "fire sale", this is a post-scarcity business model that we have been adopting, and let me say that it's been working really well for us. I'm continuing to see a lot of people join as Magnatune members, and can proudly say that each day, we make twice as much money from our memberships than from our download sales. Memberships have quite literally turned our business around, so that we're growing strongly again. We're simply continuing to face the "Internet Reality": a world where everyone has more music than they know what to do with (from Bittorrent to Last.fm and beyond). The way to compete in this new world is not try to create artificial scarcity, but offer something better than what is available for free, in all ways that we can think of. In other news, we're putting the finishing touches on the Magnatune iPhone Application. You'll be able to listen for free to all Magnatune albums. Non-members will hear my slightly-annoying voice at the end of each track, telling you what you just heard, while members can enjoy all our albums, commercial free, on their iPhone. Assuming that Apple accepts the application, it'll be an easy download from the iTunes Application Store. I recently returned from 10 days in Sweden, speaking at two conferences. The first conference was the Nordic Cultural Commons Conference organized by open-law wunderkind Herrko Hietanen. I got to reconnect with the always-inspiring Paul Gerhardt and his Archives for Creativity Project and pontificate leisurely with him about what "Britishness" is, while the conference organizers had us drinking champagne several hundred feet underground in Stockholm, in a former top-secret nuclear reactor lab called "R1". Victor Stone of CC Mixter was there, and he and his wife provided the ambient audio/video to the nuclear-reactor party. I got reconnect with both founder and also the current head of Pirate Bay, since we were on the same panel together. A few hours drinking mojitos with Rickard, the head of the Swedish Pirate Party. At the first night's dinner, the quiet unassuming lawyer sitting opposite me turned out to be Till from the GPL Violations project! Also got to spend time with Timo from Star Wreck, who is working on his new film Iron Sky. I might get involved with Star Wreck 2, helping them fight evil in the movie business. Stockholm is incredibly gorgeous: 11 islands, bridges & water everywhere, grand buildings. A cuisine that is clean, fresh, light and honest. Ate twice at two of my favorite Stockholm restaurants: Wedholms Fisk and Lisa Elmqvist which is inside one of the great food markets of the world: Ostermalms Saluhall. This was one of the best conferences I've ever attended, perhaps not surprising as one of the other all-time-best conferences was another one in Finland: OpenMind 2006, where I met Herrko, the Star Wreck boys, Vili Lehdonvirta and Andreea Chelaru. Finland creates wonderful things. Next I went to Gothenburg to the FSCONS conference, which was a joining of the Free Software Movement and the Open Culture Movement. Many interesting talks, but by far the best were those by Smári McCarthy, including a brilliant keynote he did about Crowdsourcing Democracy: : applying the lessons of open source culture to governance. and the slides to that presentation may also be downloaded. Just before the Swedish conferences, I was in Frankfurt attending & speaking at the Frankfurt Book Fair, about BookMooch.